Situated on the grounds of the Boca Beach Club on the point of the Boca Raton Inlet, the prestigious oceanfront community of One Thousand Ocean features 52 ultra-luxury condominium residences within a single, impressive nautilus shaped seven-story building. In a dream location, residents enjoy access to world-class amenities and unbeatable ocean views while living conveniently near all of the area’s most popular attractions. One Thousand Ocean offers a variety of floor plans from which to choose with an average of 4,000 square feet of lavish living space. Available condos for sale include single-story condos, beach villas, and penthouses, offering premier oceanfront living at its absolute finest. All condos at One Thousand Ocean have ocean-inspired, modernist architectural styling as well as spacious terraces with 1,200 square feet of private outdoor living space. Additional high-end features include marble tile floors, open-concept layouts, and spacious modern kitchens complete with state-of-the-art appliances and granite countertops. 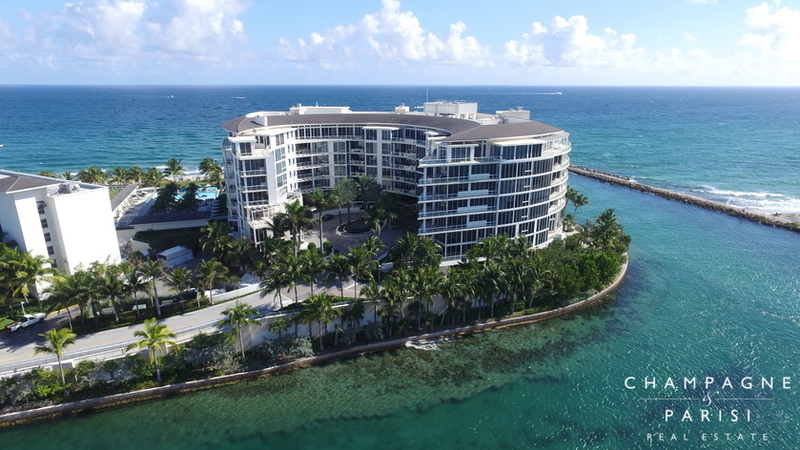 These exclusive condominiums also boast oversized bedrooms, spacious walk-in closets, luxurious bathrooms, and floor to ceiling windows offering unobstructed views of the Atlantic Ocean and Boca Inlet. With the purchase of a club membership, Residents of One Thousand Ocean may also enjoy the world-class amenities offered by the nearby Boca Raton Resort & Club. Some of the amenities available at this prestigious resort include two artfully designed championship golf courses, thirty Har Tru tennis courts with on-site tennis pros available for private and group instruction, luxurious spa and salon, three resort-style swimming pools, several fine dining options, full-service marina, and more! One Thousand Ocean, named for its address, is located on A1A just North of Camino Real. Situated directly on the point of the Boca Inlet, One Thousand Ocean is in a convenient location allowing residents a short trip to enjoy fabulous restaurants, specialty shops, retail establishments, pristine beaches, award-winning golf courses, local parks and other attractions. If One Thousand Ocean sounds like the perfect place to enjoy the luxurious and exclusive beachfront lifestyle you desire, you may also want to visit other ultra-luxury oceanfront condominiums in Boca Raton including Excelsior, Aragon, and Luxuria. If you would like to learn more about condos for sale in One Thousand Ocean or any of the surrounding luxury condominium communities in Boca Raton, please call us at 561-998-9015. You may also reach us by completing the simple online contact form provided below and one of our luxury real estate specialists will reach out to assist you. We at Champagne & Parisi Real Estate look forward to assisting you in finding your next dream luxury condo in Boca Raton, FL!